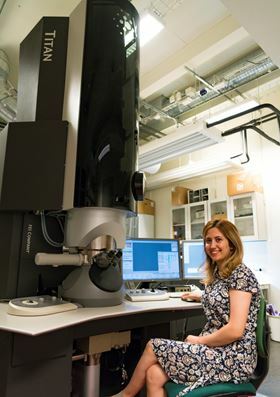 Nooshin Mortazavi from Chalmers University of Technology with a Titan transmission electron microscope, which was used to investigate the nanocrystalline oxide that forms on high-temperature alloys. Photo: Johan Bodell/Chalmers University of Technology. Many current and future technologies require metal alloys that can withstand temperatures of 600°C and above without corroding. Now, researchers at Chalmers University of Technology in Sweden have hailed a major breakthrough in understanding how such alloys behave at high temperatures, pointing the way to significant improvements in many technologies. They publish their findings in a paper in Nature Materials. Developing alloys that can withstand high temperatures without corroding is a key challenge for many fields, including renewable and sustainable energy technologies like concentrated solar power and solid oxide fuel cells, as well as aviation, materials processing and petrochemistry. At high temperatures, alloys can react violently with their environment, quickly causing the materials to fail by corrosion. To protect against this, all high-temperature alloys are designed to form a protective oxide scale, usually comprising aluminium oxide or chromium oxide. This oxide scale plays a decisive role in preventing the metals from corroding. Therefore, research on high temperature corrosion is very focused on these oxide scales – how they are formed, how they perform at high heat and how they sometimes fail. The paper in Nature Materials provides insights into two classic issues relating to high-temperature alloys. One applies to additives of so-called 'reactive elements' – often yttrium and zirconium – that are present in low concentrations in all high-temperature alloys. The second issue is about the role of water vapor. "Adding reactive elements to alloys results in a huge improvement in performance – but no one has been able to provide robust experimental proof why," explains Nooshin Mortazavi, a materials researcher in Chalmers' Department of Physics and first author of the study. "Likewise, the role of water, which is always present in high-temperature environments, in the form of steam, has been little understood. Our paper will help solve these enigmas". In the paper, the Chalmers researchers show how these two issues are linked. They discovered that not only do the the reactive elements in the alloy promote the growth of the aluminium oxide scale, but they also cause the oxide scale to grow inward rather than outward. This facilitates the transport of water from the environment, towards the alloy substrate. Reactive elements and water combine to create a fast-growing, nanocrystalline, oxide scale. "This paper challenges several accepted 'truths' in the science of high temperature corrosion and opens up exciting new avenues of research and alloy development," says Lars Gunnar Johansson, professor of inorganic chemistry at Chalmers, director of the Competence Centre for High Temperature Corrosion (HTC) and co-author of the paper. "Everyone in the industry has been waiting for this discovery. This is a paradigm shift in the field of high-temperature oxidation," says Mortazavi. "We are now establishing new principles for understanding the degradation mechanisms in this class of materials at very high temperatures." Further to their discoveries, the Chalmers researchers also suggest a practical method for creating more resistant alloys. They demonstrated that there exists a critical size for the reactive element particles. Above a certain size, the particles cause cracks in the oxide scale that provide an easy route for corrosive gases to react with the alloy substrate, causing rapid corrosion. This means that a better, more protective oxide scale can be achieved by controlling the size distribution of the reactive element particles in the alloy.